Scott Beattie’s gold medal winning performance in the U20 Men’s 8k event was very much a big part of some excellent Morpeth Harriers achievements at Saturday’s Northern Athletics Cross Country Championships. Beattie grabbed the lead on the second lap at Knowsley Safari Park on Merseryside to establish an excellent winning margin of 13 seconds over fellow race favourite Patrick Dever of Preston Harriers, with Hugo Milner of Derby taking third place, a further six seconds adrift. It also saw Beattie clinch his second Northern Championship Individual gold medal, having won the U17 Men’s title at Blackburn in 2016. Unfortunately, Morpeth Harriers only had three runners competing in the U20 Men’s event, so Beattie’s excellent performance could not be matched by a team performance. Nevertheless, the efforts of James Young (32nd), and Phil Winkler (43rd) were substantial on an individual front, and another decent run by another fellow clubmate would have probably seen them amongst the medals. Morpeth Harriers Senior Men just missed out for team gold by a mere two points to Sale Harriers in their three lap 12k event. They were led home by an excellent performer in Peter Newton, who worked hard throughout to win a superb individual Bronze Medal. Further excellent team support came from Nick Swinburn (9th), Carl Avery (13th), Robert Balmbra (44th), Ian Harding (45th), and Sam Hancox (75th). 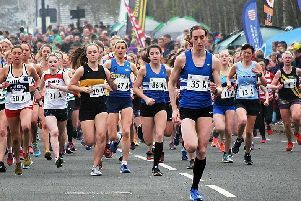 Morpeth Harriers Senior Women and U17 Men narrowly missed out on team medals in their respective 8k and 5.8k events.